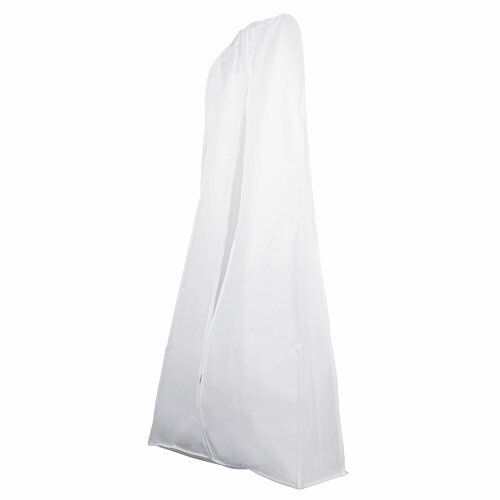 Our wedding dress preservation bag keeps your dresses neat as well as free from any dirt and dust. It's made of breathable non-woven fabric with central zipper closure attached for your convenience. Why you must use our garment bags for long dresses? Neat and Clean Dresses - Guaranteed! Your precious wedding gowns need special care to keep it in good condition, so you'll need this wedding dress storage to prevent the dress from yellowing. Made of non-woven fabric, this dress bags for storage comes with central zipper closure to protect your gown dresses from dust, water, and dirt! You can fold this wedding dress travel bag to save more space when traveling. It has a size of 71 x 32 x 9 inches with a Clear Pouch Pocket for Labeling. This wedding gown storage bag is also suitable to keep long coats, man's suits, graduation dresses, as well as long and thick dresses safely and neatly. BEST GARMENT PROTECTION - This wedding dress garment bag protects your precious dresses from dust and dirt, preserves fabrics in excellent condition, and effectively prevents yellowing. PREMIUM MATERIAL - Our wedding dress garment bag is made of breathable, water resistant, and super soft non-woven fabric to secure your dresses in excellent condition. COMPACT DESIGN - With the size of 32 x 71 x 9 inches and sturdy central zipper closure, this wedding gown garment bag is the best choice to protect your evening dresses and other floor length gowns. CLEAR POUCH POCKET FOR LABELING - This bridal gown garment bag has a clear transparent pocket which allows you to label your bridal gown easily. You can also fold this long garment bags to save more space while traveling. MULTIPURPOSE BAG - Safely store your dresses, leathers, furs, and suits with our wedding gown storage bag. It's not only for wedding dresses but also perfect for bridesmaid, pageant, christening, evening, graduation and ball gown. Order now! If you have any questions about this product by Wedding Gown Bag, contact us by completing and submitting the form below. If you are looking for a specif part number, please include it with your message.